Great place, location and view. Perfect location. Good size apartment; very well maintained. All mod cons. Great view from the balcony. Nicole charming and easy to deal Wright. Stunning views from comfortable apartment. Comfortable apartment with everything you need to enjoy your stay. The apartment was exactly as advertised and Nicole was very welcoming. Shops and restaurants are just minutes walk away and we used the trains (station just a short walk away) to visit Monaco, Menton, Cannes, Antibes and Nice. Perfect location with fabulous views and very peaceful. We would definitely recommend a stay here. Nous y avons séjourné 11 nuits à l’été 2018. Emplacement idéal pour visiter la Côte d’Azur. Le condo est entouré des commodités nécessaires pour passer un beau séjour. Appartment with good size balcony and views over the beautiful harbour and the sea. 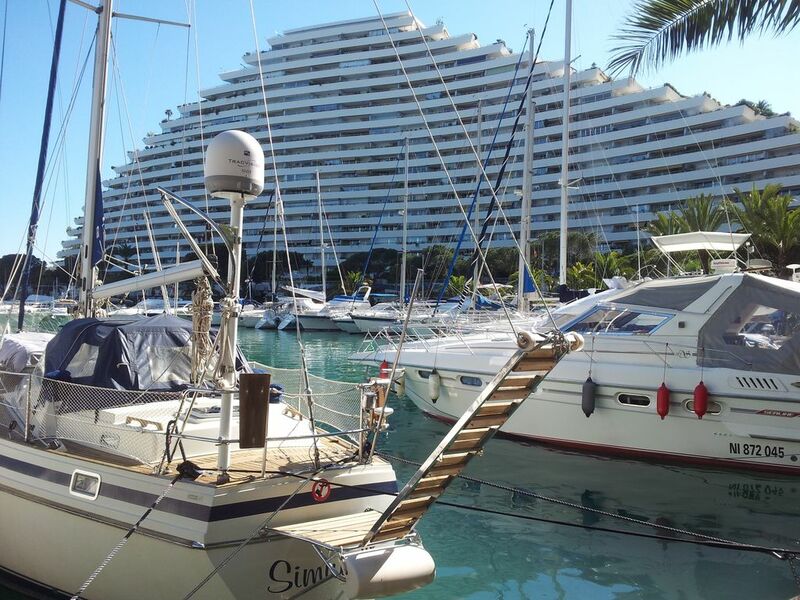 The appartment is situated next to the harbour in Villeneuve-Loubet and we really liked the large balcony that were perfect for lunches in the shadow while looking at the beautiful view of the sea. Nice , not to crowded beaches with in walking distance and many good restaurants in the area. Also a big plus was that we could rent parking space in a garage in the same building. Perfect right in between Nice and Antibes. Wir haben es sehr genossen. Der Strand ist nicht weit, man kann alles zu Fuß machen. Sehr schöne Sicht auf Meer und Hafen. Madame Mendez ist eine sehr nette Gastgeberin und das Appartement ist für eine 4-köpfige Familie ausreichend groß, gut ausgestattet und ruhig und sehr sauber. Wir sind eigentlich recht anspruchsvoll, hatten aber nichts auszusetzen. Des frais supplémentaires peuvent ne pas être inclus dans les tarifs ci-dessus. Merci de demander un devis complet ménage : 50 € le séjour. En option : SUR RESERVATION : parking couvert sécurisé : 50 € la semaine payable à l'arrivée - Location de linge de maison draps, serviettes de toilette, tapis de bain, torchons : 50 € la semaine pour 2 personnes payable à l'arrivée.